Many contemporary tribal artists reach to their nations’ historical sources for inspiration, which provides for a certain continuation of tradition. However, they do not always admit that reference. This makes the process of “joining stylistic dots” much harder, but not impossible. 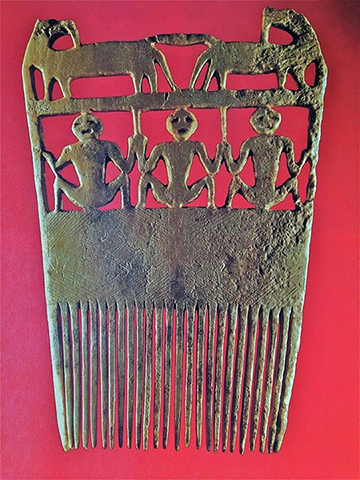 The comb presented below, carved c. 1977 by Stanley Hill, Sr., (Mohawk Clan) is an interesting and competently executed interpretation of an ancient Seneca Iroquois antler comb that dates back to the late 1600s. 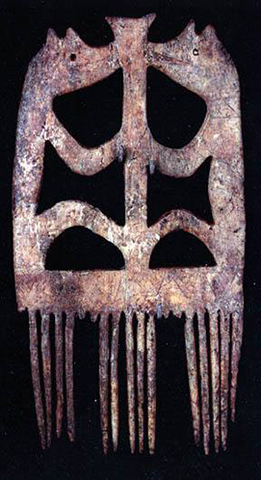 This crudely carved and incised comb depicts two wolves, clan symbol of the Wolf Clan. They stay on the roof of a cosmic longhouse that symbolizes the political structure of the Iroquois Confederacy. Within the longhouse, three human figures squat in a so-called “hocker” position, which many women in traditional societies assume when giving birth. However, these figures most probably represent the three eldest brothers (Cayuga, Oneida and Tuscarora) of the Iroquois Confederacy, representing the Seneca, Onondaga and Mohawk nations. Here are two other effigy-related examples from the The Eugene and Clare Thaw Collection, which resides at the Fenimore Art Museum in Cooperstown, NY. The first depicts two wolves facing each other without other imagery, and dates c. 1660 – 1675. 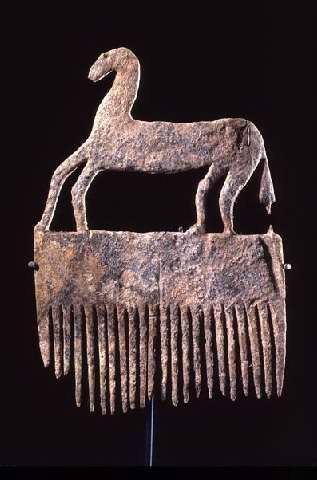 The second is a Seneca Horse Effigy Comb, made c. 1670 – 1687 from moose or elk antler. It was found in the 1930s at the Ganondagan State Historic Site, also known as Boughton Hill, in the town of Victor, Ontario County, New York. 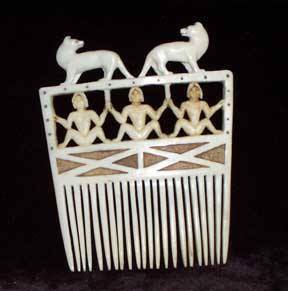 The museum speculates that the comb’s image of the single horse may relate to the introduction of European horses in Seneca country in the late 1600s. This seminal event turned many tribes into horse cultures. An excellent piece was found buried with a Seneca shaman woman during the construction of an upscale neighborhood in Toronto. It dates from the late 1600s when the area was the Iroquois city of Teiaiagon (crosses the stream), a land with a river of dangerous rapids. 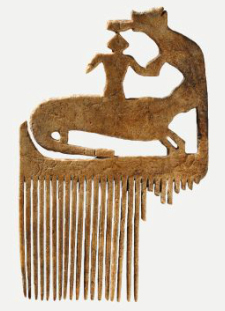 On the comb, engraved lines connect three shapes, or characters — Mishipescheu (a water lynx with the tail of a rattlesnake), a bear, and the shaman. The themes are continuity of man and spirit, and protection. 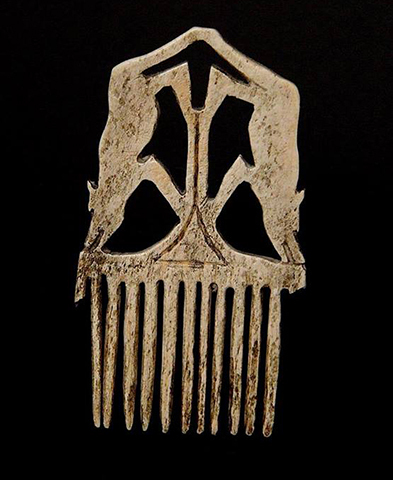 Last is a comb from my own collection to close this story for today.